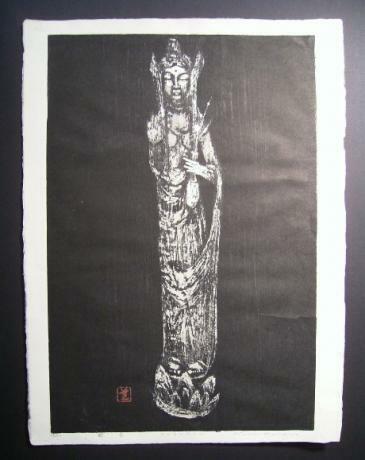 Japanese 20th Century woodblock print entitled KWANNON by KAWANO KAORU. Numbered 34 out of 100. Fine color and impression. The paper measures 18" wide by 24" tall. The actual print measures 15" wide by 22 1/2" tall. Japanese Edo Period prints (2) by TOYOKUNI III from the Kabuki play, "ICHIJO OKURA MONOGATARI". These 2 may be part of what may have originally been a triptych. Each print measures 9 3/4" wide by 13 3/4" tall each. The prints have been laid down. Insect damage in few areas. 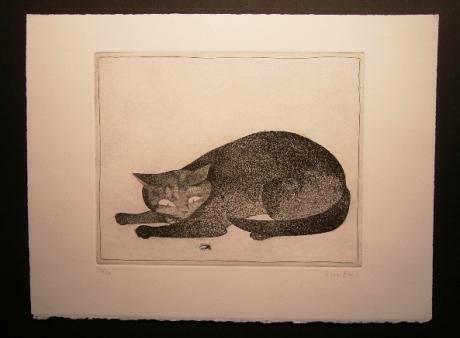 Japanese 20th Century print of a cat looking at a bug by INUKAI. Numbered 10 of 10. Fine impression. The paper measures 15" wide by 11 1/4" tall . The actual print measures 10" wide by 8" tall. Japanese Edo Period woodblock print by HOKUSAI (1760-1849). 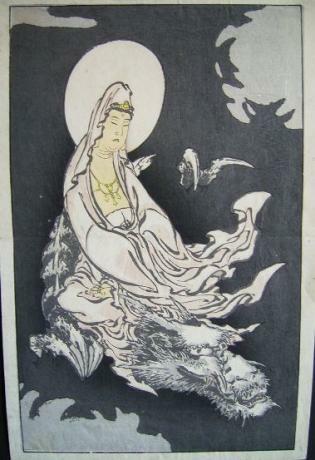 The print is of a goddess riding on the back of a dragon. The print is made up of 2 small pages. The print is laid down on paper. The paper measures 8 3/4" wide by 13 3/8" tall. The print measures 8" wide by 12 5/8" tall. 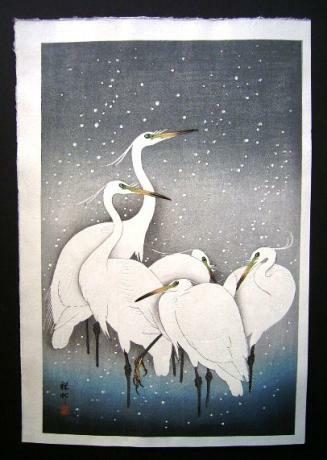 Japanese Mid 20th Century print of "Snowy Herons" by HASHIMOTO KOEI (1899-?). Signed and stamped by artist in upper right hand corner. c 1955. Fine color and impression. Published by the Uchida Company. The paper measures 11 3/4" wide by 17 3/4" tall. The print measures 10 1/4" wide by 15 3/4" tall. 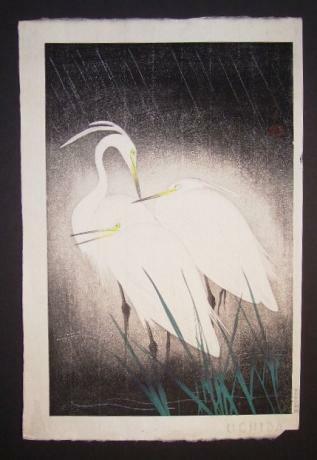 Japanese Late 19th to Early 20th Century woodblock print by SHOSON OHARA of group of 5 white heron. Fine color and impression. Some of the feathers of the herons are embossed. Signed by artist in lower left hand corner. The paper measures 10 1/2" wide by 15 1/2" tall. 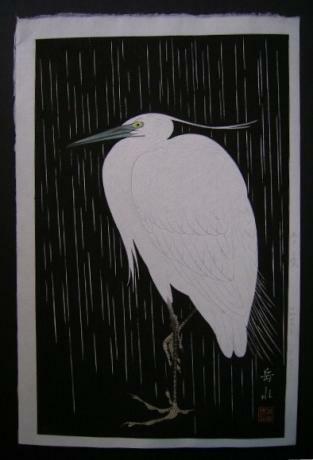 The print measures 9 1/4..
Japanese Mid 20th Century print of "White Heron in the Rain" by IDE GAKUSUI (1899-1982). Signed and stamped by artist in lower right hand corner. Also, title and date in lower right hand border. Printed in Showa 25, or 1950. The feathers of the heron are embossed. Fine color and impression. 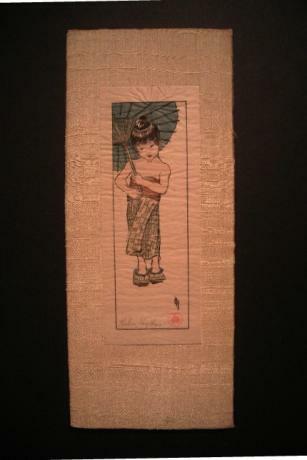 ..
Japanese woodblock print of summer girl by Helen Hyde. Very nice color and impression. The print measures 3 1/8" wide by 8 1/4" tall. Stamp and pencil signature of artist, Helen Hyde. Print has been laid down onto silk covered board. 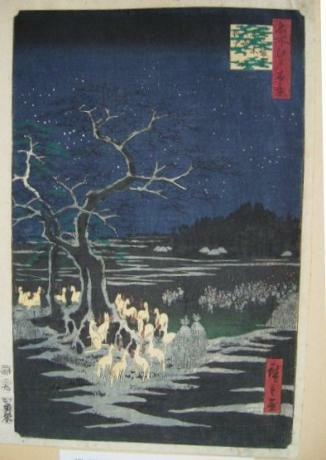 Japanese Edo Period woodblock print by HIROSHIGE (1797-1858). 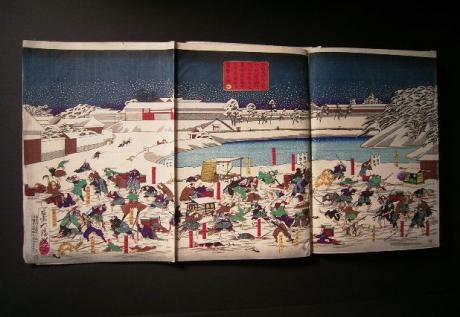 The print is from Hiroshige's famous MEISHO EDO HYAKKEI, One Hundred Famous Views of Edo. This is number 118 from the series. It is called Oji, Shozoku-enoki, omisoka no kitsune-bi, New Year's Eve Foxfires, at Nettle Tree, Oji. 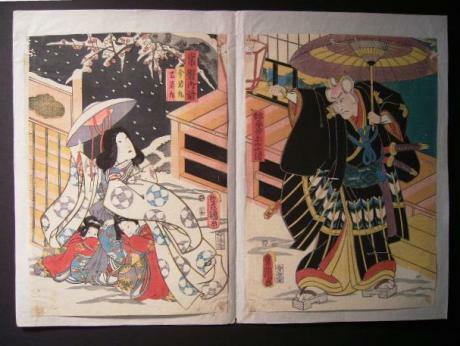 The pape..
Japanese Meiji Period woodblock prints (6) by Yoshitoshi. The six panels of prints are of a war scene. Each panel measures about 9 3/4" wide by 14 1/2" tall.